David Megarry, player in the original Blackmoor Campaign is to host the board game Dungeon! at GaryCon this year. 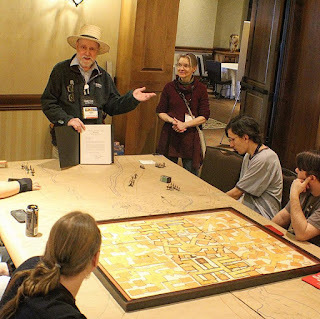 David Megarry created the game partly because he saw how taxing DMing was on Dave Arneson and wanted to create a Blackmoor-like experience without the need to have a DM. I wrote a bit more about this back in 2011. The game was first published in 1975. The photo and information below was just posted at the GaryCon Facebook Page. 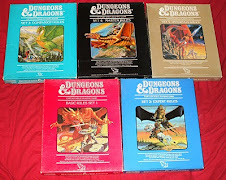 I've only just come to the conclusion that the main reason I was able to learn the Dungeons & Dragons RPG was due to Mr. Megarry's wonderful board game (which still entices young children to play, even today). If I could make it to GaryCon, I'd shake his hand. DUNGEON! was a huge part of my early gaming years. Hope I can grab a seat this year. I got to play a Brownstein session with Dave Wesely last year; THAT was awesome as well. Checked off the bucket list.